HOW TO ESTABLISH A BUSINESS? 1. Business-Friendly and Stable Environment Georgian legislation offers unconditional protection of investments. Assets of a foreign investor shall not be subject of expropriation. 2. Georgia-EU Association Agreement Georgia signed an Association agreement with EU, which provides Georgian companies an access to European markets. 3. Flat/Low Taxes and Incentives According to the Constitution, increasing tax rates in Georgia is only possible through the Referendum. 4. Liberal Economic Legislation Georgian economic legislation is strongly investor oriented. Several State laws of Georgia are specifically dedicated to facilitate and stimulate both local and foreign investments. Georgia is one of the leaders in the world in terms of ease of business start-up procedures. 5. Strategic Geographic Location Batumi is one of the fastest developing cities in Georgia. It is bridge between Europe and Asia. 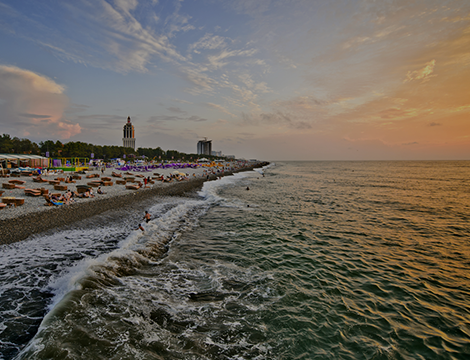 Batumi is situated in western and central parts of Trans-Caucasia between Black and Caspian Seas, on the crossroad of the ancient Silk Road that connected Asia and Europe. MINISTRY OF FINANCE AND ECONOMY OF AJARA A.R.